Genome sequence of a 5,310-year-old maize cob provides new insights into the early stages of maize domestication. The specimen is important because it dates to a point in time approximately halfway between the beginning of maize domestication and today’s corn. In a gene-by-gene analysis, the ancient sample shows that many key genes had already been affected by human selection, including the lack of a hard seed coat and changes in flowering time. Other traits were not yet under selection, including sugar content of the kernels and, surprisingly, a gene that is related to dispersal of kernels from the plant. These details are the result of a study conducted by postdoc Nathan Wales and PhD student Jazmín Ramos Madrigal from the Natural History Museum of Denmark. The results have just been published in the scientific journal Current Biology. Researchers have long debated how and why ancient people domesticated maize, in large part because the wild ancestor of maize—known as teosinte—provides surprisingly little nutrition. Each teosinte ear produces only 5 to 12 kernels, and each kernel is surrounded by a hard casing that must be removed prior to eating. 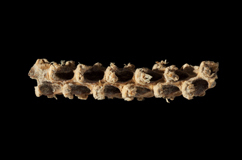 Photo: Ancient DNA from this 5310-year-old cob sheds light on maize domestication. Credit: Bruce Smith. Now, the impressive study of a 5,310-year-old maize cob from the Tehuacan Valley of Mexico brings us closer to answering these questions. - Our study is like a genomic window into the past, says postdoc Nathan Wales, who has conducted the research together with his colleague PhD student Jazmín Ramos Madrigal, both from the Natural History Museum of Denmark. 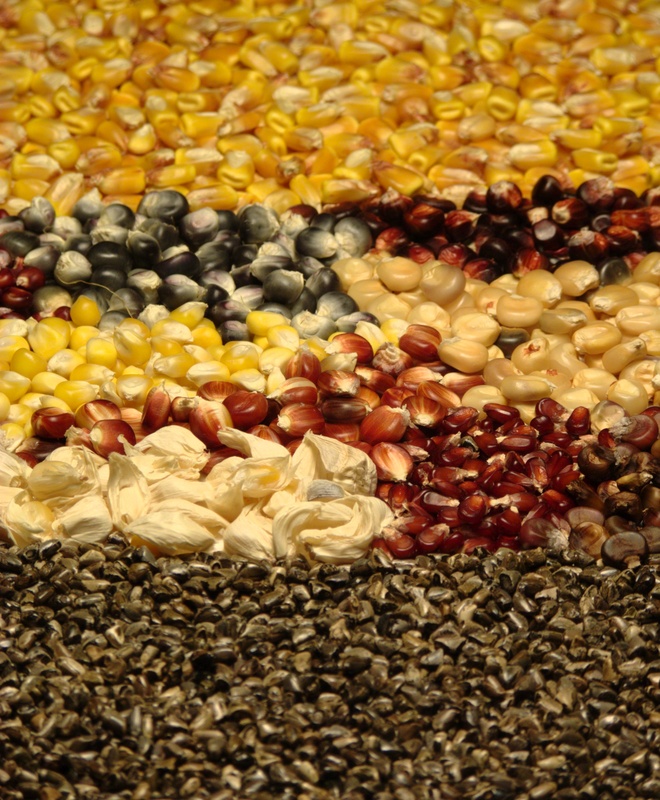 - By exploring the genetic history of this ancient maize it is now possible for us to infer how people used the crop in the past, selecting for certain traits at different points in time. The study first of all shows that the ancient cob is genetically intermediate between teosinte and modern maize. In a gene-by-gene analysis, the ancient sample shows that many key genes had already been modified through human selection, including the lack of a hard seed coat and changes in flowering time. Photo: The evolution of wild teosinte kernels (bottom) to domesticated maize varieties (middle) to modern commercial corn (top). Credit: Thomas Kono. Other traits were not yet under selection, including sugar content of the kernels and, surprisingly, a gene that is related to dispersal of kernels from the plant. - Wild plants naturally release their seeds at the appropriate time, but humans have modified domesticated cereals so they retain their seeds so they can be easily collected from fields. The finding that the ancient maize cob has the ancestral version of the gene is unexpected and encourages further research. Archaeological evidence suggests the people who planted and consumed maize 5000 years ago likely lived in small groups of several dozen people from extended families. - Unlike most modern farmers, these ancient people moved seasonally and mostly consumed wild plants and animals, but supplemented their diets with some domesticated plants. It was only during later periods with higher populations and socially stratified societies that maize became the food staple. For example, the Olmecs (~1200 BC) and the Maya (200BC – 1000 AD) required reliable and predictable food sources to support their cities, and it was at that point that maize would have undergone further selection for important traits. Aztec Empire rises and later declines due to Spanish conquest. City of Teotihuacan at peak in Central Mexico. Maya city-states dominate southeastern Mexico and Yucatan. Olmec civilization in Guatemala and southern Mexico. Villagers using ceramics in Mesoamerica. Tehuacan 162 maize cob grows and is collected. Humans spread maize from the lowlands to the higher elevations in Central Mexico. 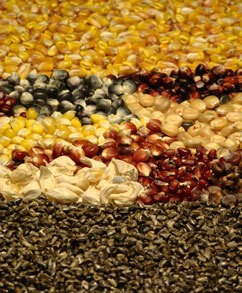 Maize is domesticated in the Balsas River Valley of south-central Mexico. Paleo-Indian populations in modern-day Mexico hunt large mammal species. First humans arrive in North America from Asia via Beringia. Photos on this web site can be used in connection with publicity of this story. The photographers must be credited. Click on the images for larger resolution.